There’s profundity in boredom, or at least that’s what most Waiting for Godots seem to argue. It’s an impossibly dull play to watch, purposefully so; the theatre usually has at least one groaner, one snorer and maybe a blunt high schooler or two complaining that it’ll all start again after intermission and nothing’s likely to change. It’s a marathon; I bought a large coffee before it began AND another at intermission to survive my matinee. Nothing happens, everyone speaks remarkably slowly, and you just want to hit every single character over the head with your shoe. Which is not to say that Soulpepper’s production is bad, or even that the play is bad. 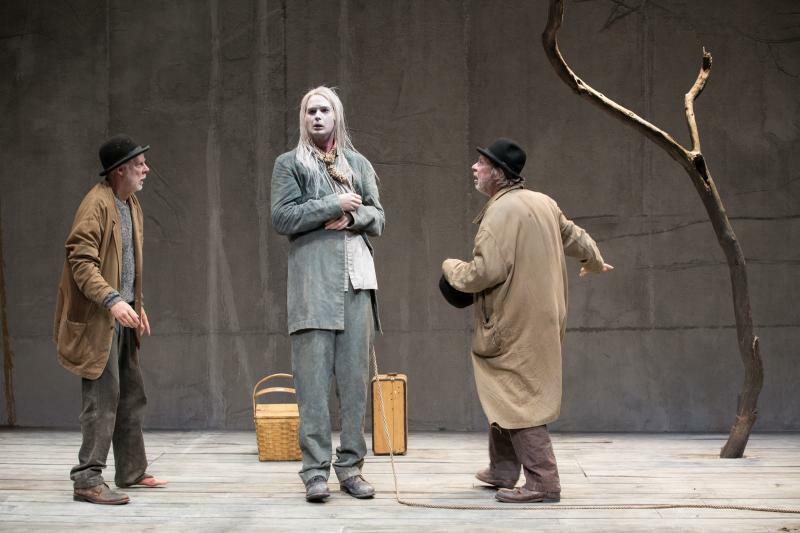 There are more quotable lines of wisdom in Waiting for Godot than maybe in any other play in history. There are endless philosophical contemplations to be had about Godot (though “he’s not God”, Beckett was quick to proclaim when still alive enough to do so; nowadays we’ll believe Godot represents whatever the heck we’d like him to represent thank you very much). There are life lessons about everything from friendship to kindness to hope to appropriate footwear in the play and Soulpepper’s strong cast delivers many of them well, though I wouldn’t have minded a bit more tenderness between Diego Matamoros and Oliver Dennis as the waiters (as in people who wait, you know what I mean). Lorenzo Savoini’s set and Daniel Brooks’ staging are bleak and cold and slow but Beckett’s text is so prescriptive that to expect something different would be unreasonable. Godot just is what it is, which is sort of the point. 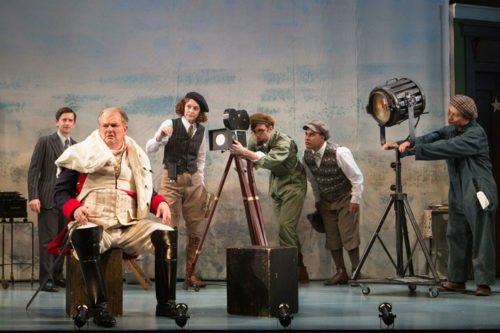 But perhaps the most clever thing about Soulpepper’s Godot is its pairing with Picture This, a wacky Hollywood farce set in a grand Budapest hotel and desperately trying to be half as cute as a Wes Anderson movie. The two hours and ten minutes that make up this abundantly dumb waste of an all-star cast make Waiting for Godot‘s two hours and forty minutes feel in retrospect like a breeze, but a profound breeze, because it also seems so much more meaningful when put into context against something so grotesquely meaningless. I got on board years ago with Soulpepper’s idea to pair a silly farce with every heavy art piece but I absolutely demand that said farce be well-produced and actually funny. This was neither of those things. My favourite film critic has a theory that there are two James Francos- the serious, talented actor who delivers work like 127 Hours, and the grinning buffoon who can’t act his way out of a paper bag in Spider-Man, among other things. Well, this play convinced me that there are two Nancy Palks, two Robert Persichinis, and two of most other people who are brilliant most of the time. There’s only one Paolo Santalucia and one Frank Cox-O’Connell, though, because they are both their usual level of delightful despite having basically nothing to do. There’s also only one Michelle Monteith but she’s been so drastically miscast that it doesn’t do her any good. Even Jordan Pettle’s indomitable charm proves domitable with such brutal directorial pacing and the least likeable cast of characters I’ve ever seen. And, again, this is programmed opposite Waiting For Godot! Everyone in Waiting for Godot is infuriating but I’d rather be locked in solitary confinement with them than ever see Picture This again. I love Soulpepper. I think they, more than any other large company in the country, try really hard to make good art- smart art, inclusive art, challenging art, entertaining art- and they do it at such a perfectly calibrated level of professionalism and accessibility that they make people actually get up and go to the theatre. They’re a little bit magical. But Picture This was the worst thing I’ve ever seen them do, one of the worst things I’ve seen anyone do all year. But maybe that was the plan, it was all a grand scheme to make us appreciate Waiting for Godot. I guess it sort of worked.